Biral, a leading meteorological specialist, has supplied its BTD-300 Thunderstorm Detection system and VPF-750 Visibility and Present Weather Sensors to six military air bases in Taiwan, giving the company its first military application for the new BTD-300. Taiwan, officially named the Republic of China, currently has 10 air bases across the island, all of which are occupied by military personnel to defend the airspace over the country. Biral’s BTD-300 Thunderstorm Detection system and VPF-750 Visibility and Present Weather sensors are installed at six of the main bases to help to improve the safety and efficiency of operations during thunderstorms and poor weather conditions. The BTD-300 is a high quality engineered unit which is designed to intelligently detect and range both cloud-to-cloud and cloud-to-ground lightning, reporting back to operators the distance and bearing of the lightning strikes. The detection system can detect a strike within an impressive 83km radius and can warn of possible lightning before it begins. In having this extra time, operations can be stopped safely and the correct safety actions taken, for example, aircraft fuelling or the movement of armaments may be suspended. The system continues to detect and report lightning that has passed the area to allow workers to resume their operations more quickly. This reduces downtime on the bases, improves operational efficiency and allows flights to proceed safely. 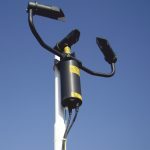 The VPF-750 Visibility and Present Weather sensor is another of Biral’s advanced meteorological systems which allow operators to identify and report the current weather conditions including freezing precipitation. The sensors have a large measurement range up to 75km and superior accuracy via their two sensor design. Unaffected by obstacle warning lights, the sensors are highly reliable and use a highly corrosion-resistant hard coat anodised finish to prevent deterioration from harsh weather conditions, even in marine installations. Further information is available from Biral on +44 1275 847787 or contact us here.